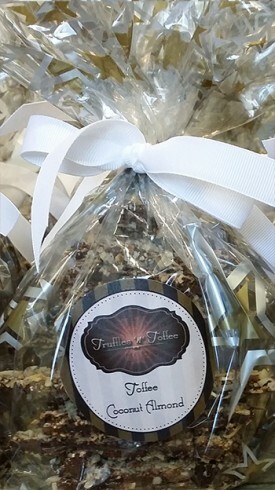 Truffles 'N' Toffee | Whether you're a fan of milk or dark chocolate, we've got you covered! Our 7th Beer & Chocolate Pairing Event!!! This is a special ticketed anniversary event on Friday February 15th from 7pm – 9 pm. Please call to make your reservations as seating is limited. 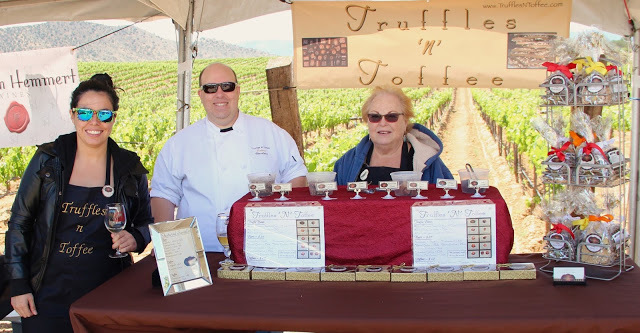 Coming this Mother’s Day, we will be @ Triassic Vineyards for a Wine and Chocolate pairing event. For tickets and information, please contact Triassic @ 661.822.5341. We hope to see you there. We are now working with Barrett Cellars!!! Join us @ Barrett Cellars. New dates coming in 2019, but feel free to stop by and purchase some chocolates & wine. Whether you are a fan of milk or dark chocolate, we’ve got you covered! We take pride in offering products that are made from fresh pure ingredients. We use no preservatives or stabilizers, only rich Belgian chocolate. All of our chocolates are hand crafted and hand tempered. It’s love at first bite: Original English and Coconut Almond. A delicate slice of buttery toffee surrounded by dark chocolate. Do you find dark chocolate too bitter? Not our toffee, just a rich, smooth, deep chocolate flavor. Once you try it, you will be addicted. Do you need Vegan Chocolates? If so, please contact The Sanctuary At Soledad. They carry our complete line of Vegan Chocolates! They are located at The Grove every Sunday from 9AM to 5PM. So, if you live nearby or are just passing through, stop and pet a goat or a piggy and purchase your Vegan Chocolates. Bar Chocolates: Almond Praline, Toasted Coconut, Peppermint (special order only), Lavender, Toasted Almonds and Toasted Hazelnuts. There are 6 bars in a box. Truffles: Peanut Butter or Blood Orange Vodka. There are 12 in a box. 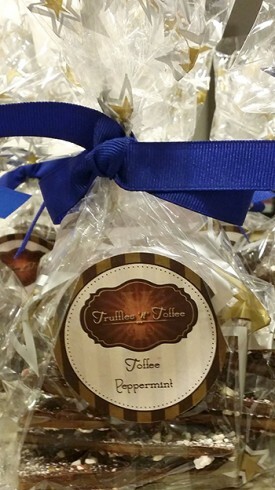 Award-Winning Pecan Toffee (Fresh-toasted pecans infused into our toffee and hand-dipped into Dark Chocolate). Be sure to check out our Pairings page to see which of our chocolates will pair wonderfully with a variety of wines, beers and other alcohols. 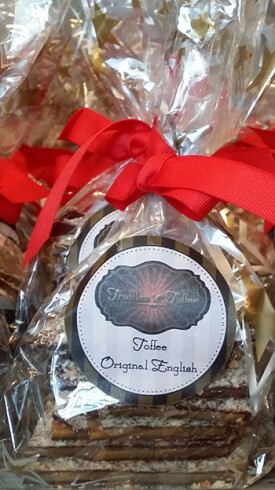 Our signature toffees make the perfect gift!